Home Event Jurassic World Alive: Week 19 Featured Dinos – Familiar Dinosaurs, different choices! Explorers! 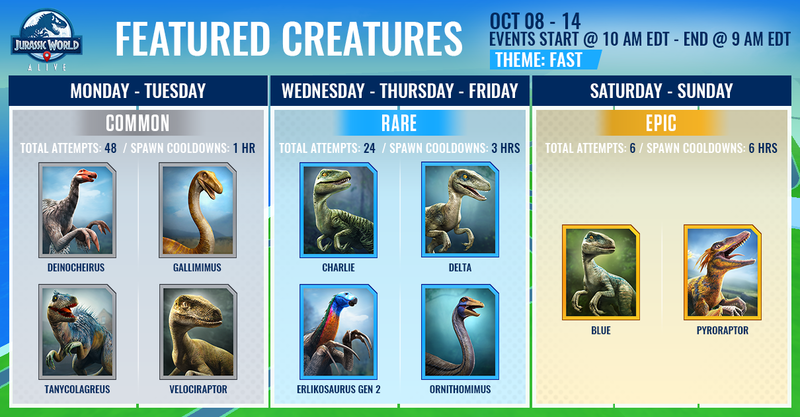 Ludia has officially announced Week #19’s Featured Dinos for Jurassic World Alive! Do not adjust your eyes (or think that Metahub has made a mistake!) because YES, we have definitely seen this “FAST DINOS” week before (and before)! When we first saw these dinos in Week #10, Raptors and fast Dinosaurs had just taken a hit with a recent update. We also saw them again in week #15… Even still, the game has changed a bit since then and some dino’s that didn’t seem very viable even just a few weeks ago, have certainly become more so now. We won’t lie, we are quite curious as to why Ludia is recycling this event again, and are very hopeful to get some NEW featured dinos in the coming weeks. Which Dinos to focus on during Week 9 of the event? For the Commons this week, one thing that remains the same is that the commons will still probably be the hardest to choose between. We are given the tough decision between Velociraptor, Gallimimus and the suddenly very important Deinocheirus. If you are attempting to create or level up Indoraptor (which requires 2,000 Velociraptor DNA per fuse, and 500 Velociraptor DNA per fuse on Indominus Rex), Velociraptor is your target. The sheer amount of DNA needed to create the Indoraptor can justify going for Velociraptor. Gallimimus is also still a very important option as it is an Arena Exclusive Dino for Jurassic Ruins (Arena 8), and fuses with Monolophosaurus to make the incredibly evasive Monomimus! If you are in Ruins however, you might find yourself already sitting on quite a bit of Galli DNA and are just waiting for another Mono event! And then there is Deinocheirus!!!! We didn’t have much to say about this Dino before (honestly we said nothing about it), but MY HOW THINGS HAVE CHANGED! Deino is required to be at level 20 to begin fusing for the incredible Apex Dino Diloracheirus and requires 2000 DNA per fuse! If you have not faced this incredible Dino in the arena yet, be grateful! If you have, you know you want it! For the Rares, not much has changed since we first saw these dinos, and none of them have any hybrids still. These will still be a matter of preference, going for the ones that aren’t in your local area, or go for ones that you want to power up on your team. For the Epics, both of these are good choices. Pyroraptor DNA (for Pyrritator – and ultimately the incredible Magnapyritor! ), has been a bit harder to come by lately and if you are low on it, use some attempts on this! Blue is also always a good choice as well, as it still doesn’t spawn in the wild and is a very strong standalone Dino. 1. You have a set number of hours to collect DNA from the Featured Dinos, as indicated on the event Dino Supply Drop once you open them. We are certainly more than a bit curious as to why we are seeing these Fast Dinos for a third time, when other dino’s have still not even been included as Featured Dinos… We definitely would like to see a bit more variety and see a few of the Dino’s that have yet to make an appearance, or made too short of an appearance. We are happy for the chance to get some of these dinos however, and we hope that you make the most of it, as we will! What do you guys think of this roster? What Dino do you WANT to see as a featured dino? Let us know in the comments or join MetaHub’s Discord server! My wife is getting annoyed (and I agree with her) because they keep doing Erlikosaurus gen 2 but have never done gen 1. She has not even discovered gen 1, let alone captured it, because it never spawns near where she works. Well, at the moment she can’t really go anywhere because she just had our 2nd baby. But I’ve only seen the gen 1 spawn a half dozen times and managed to get it that way near where I work. We each work in different cities, so she can’t just drive to my work and find it there. But well, not really feasible in a lot of cases so I guess good luck with getting it from Incubator. Can’t decide between the Rares. I have minimal DNA on all and they’re sitting at lvl 10. Any advice? Erlikosaurus gen. 2 is still an incredible dino, but he is countered by a lot in the current tank meta (armored dino with almost all of them having Superiority Strike which both gives them speek advantage and clears the very strong damage debuff). That said it’s still viable dino and it can outspeed everything if you use it as a finisher with the Minimal Speedup Strike. Add the fact that is much more likely that either Erlikosaurus gen2 or Ornithomimus are much more likely to get a new hybrid than some of them raptor squad and I would aim for either of these two.